Moong or Mung beans, also known as Green Gram is extensively used in Indian cuisine in various forms. 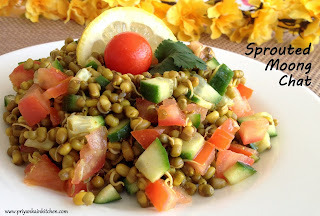 Whole Moong with or without sprouts can be used to make this highly nutritious chaat. This easy and quick to make recipe can be served as a breakfast dish, salad or anytime snack. When hot, add cumin seeds and let them crackle. Add sprouted moong, turmeric, chili, coriander powder, salt and 1/3 cup water to it. Mix everything well and close the lid. Pressure cook until one whistle. Don't cook more!!! It will turn it mushy. Now lift the whistle carefully using a fork for 3-4 seconds to let out some steam. Let rest of the pressure release on its own. Open the lid when all the pressure is released. Normally there should not be any water left. But if there is some water left, it will be absorbed by beans in few minutes. Now add cucumber, tomato, chaat masala and lemon to boiled beans. Mix well. Tip: For sprouting moong beans, soak moong beans in enough water over night or until all beans have absorbed water and doubled in size. Now drain the water and keep them wrapped in a cheese cloth until they sprout. Time varies considerably depending on climate and quality of beans.